Mumbai: The One Club for Creativity, the world’s foremost non-profit organization recognizing creative excellence in advertising and design, and The 3% Movement, the advertising industry’s leading voice for gender equality and diversity overall, today announced the 10 winners of their joint Next Creative Leaders global awards program for 2018 at this year’s 3% Conference in Chicago. 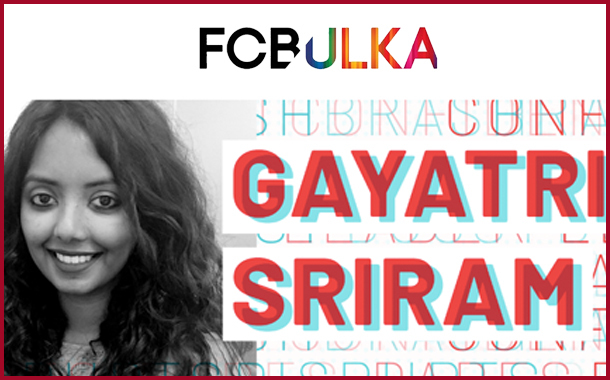 Gayatri Sriram, the Digital Creative Head of FCBUlka, New Delhi was the only Indian featuring among the top 10 Women leaders. “Being recognized in this way reaffirms that I’m on the right path, that I am making the right decisions and that there is a place for me at the table. I’m also excited about the opportunities it will open for me to grow professionally, through networking, collaboration and accessing the best minds in the industry” said Gayatri. GayatriSriram was also one among the participants of ‘Cannes Lions 2018 See It Be It’ Programme. Developed collaboratively by the organizations in 2015, Next Creative Leaders identifies and celebrates talented creative women who are making their mark with both great work and a workplace perspective on diversity that helps change the industry for the better. While most of the 2018 honorees currently work in the US, the program has a strong global element with three winners located outside the US and half of this year’s winners originally from other countries. Next Creative Leaders entrants were judged on four-to-six pieces of creative work, their background and information about how they — and their work — are pushing the industry forward and making a positive contribution in terms of diversity, mentoring and advocacy. Winners were selected by a jury of 42 top creatives, including past Next Creative Leaders winners.